It’s almost like your paperwork is multiplying right before your eyes. You take papers off of your desk, but by noon, there are more. Imagine how much more work you could get done if you could find a way to stay organized? 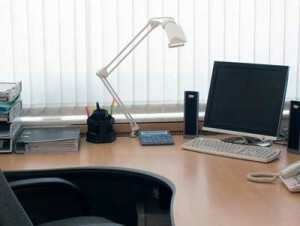 It’s easy to say, “I’ll just clean my desk on Fridays before I leave work,” but how often does that really happen? Make it a daily objective to work through your papers by the day’s end. Separate your paperwork based on how quickly you can complete them. Organize your email into folders that you give higher priority to and then sort emails in this fashion. Buy file folders, shelves, book cases…whatever it takes to help you get papers and books off your desk and out of sight. Use pencil holders and file trays for things you need daily, and keep them within reach. Everything else you can put out of sight. If you save to the relevant folder, you will find things more easily. You collect pens at trade shows and conferences, as well as those silly desk toys that are hanging around gathering dust. Designate one day a month as Desk Cleaning Day and spend a half hour getting rid of anything that doesn’t make you more productive. Haven’t used it in a month? Throw it away, give it away or put it into a drawer. I love my wireless keyboard and mouse! It stresses me out to see cords and wires strewn across my desk. Untangle your cords and make sure they all have a place to plug into your power strip. 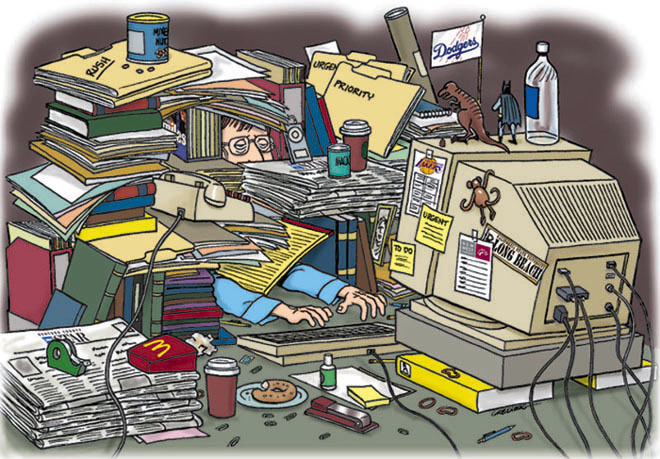 Paper is the chief cause of most clutter, so why not eliminate it? Scan important documents and save them using your new computer filing system. You can shred and toss the documents once they’re scanned. Make sure to keep any legal documents that require the originals as proof. Before you leave the office, check your calendar to see what tomorrow may bring. I like to prepare what I will need for the start of the day and get out any paperwork or files. Sometimes we honestly can’t see all the clutter because we’re so used to it. When you approach your desk, really look at it and see what’s there. What’s contributing to your productivity and what's taking away from it? It’s essential to notice the things that are out of place and put them away before they affect your proficiency.